Truffle Time- What Are These Mysterious Delicacies? Truffle Time – What Are These Mysterious Delicacies? Truffles have been considered ‘the diamond of the kitchen’ since the late 1700’s at least, if not before. While the subtle yet unique flavour sets them apart from any other ingredient, and creates a demand for the scented fungus, they are incredibly difficult to cultivate, and from a scientific point of view, are not well understood. This, in a nutshell is why they demand the price that they do, anywhere from $1000/kg to $5000/kg, wholesale. Historically part of the diet of the ancient Romans, it was the French and Italians of the 17th century that really gave the truffle its cult status. Since then the Italians have favoured the white truffle and the French the black truffle, generally speaking. For many years, it was believed that the truffle could not be cultivated, to an extent this is probably true The wild fungus is ‘micorrhizal’. This means it has a symbiotic relationship with the roots of certain trees. Particular soil composition and climate conditions are vital too. All this makes for very unpredictable yields to say the least. 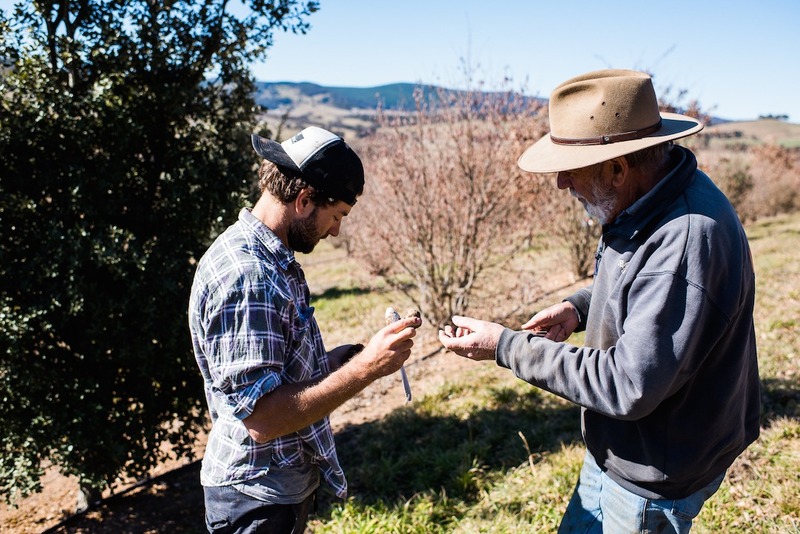 In the first week of July, We here at Yellowtail along with a few local chef mates, were invited to Oberon, in the Western Blue Mountains of NSW to truffle ‘farm’ Parada Hills. This is where Peter and Desley Loftus, along with son David, are just beginning to see some fruits of their labour. 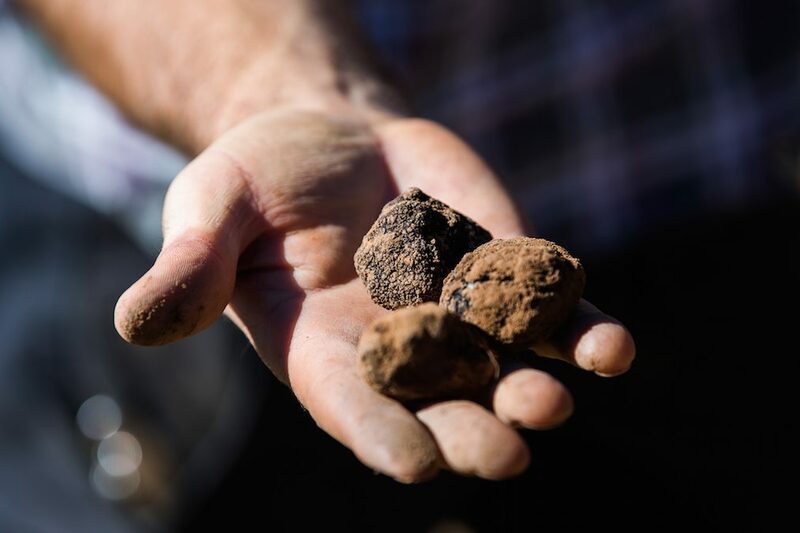 Now while growing truffles in France is an established industry, In Australia it is relatively new. I say relatively because in many cases, and certainly in Peter and Desley’s, it’s a 12 year investment before you see anything. Not only that, its 12 years before you even know ‘IF’ you are going to get anything, such an inexact science that it is. The Australian truffle industry was established in Tasmania and later in Western Australia in early 90’s. French and English oaks, and hazelnut trees were inoculated with the truffle fungus from the perigord region in France. Those early farms finally had some success around 12 years later in the mid 2000s. It was this procedure that the Loftus family have adopted. In 2006 they purchased 4600 trees all inoculated with the black truffle fungus. 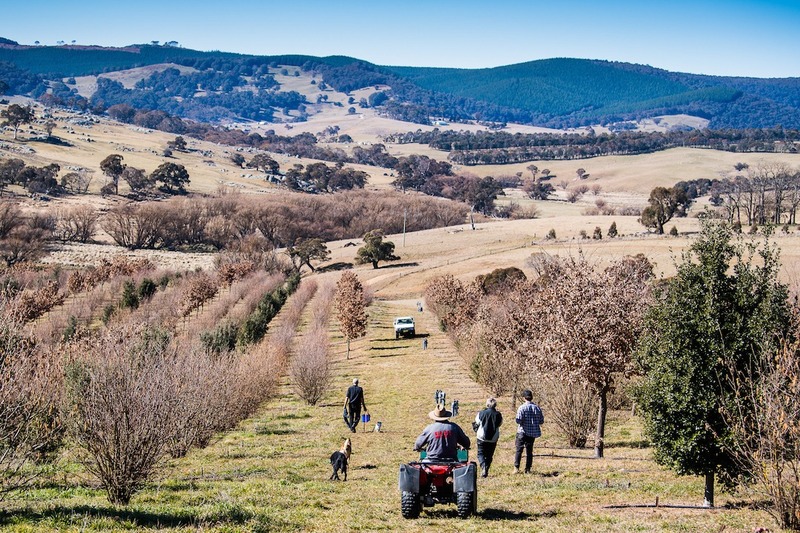 One of the biggest truffle farms in NSW and a massive investment both financially and in time. The gentle hills of there property were layered with tonnes and tonnes of lime, to mirror the chalky soils in European truffle growing areas. The trees were hand planted in perfect symmetry, with hazels, French and English oaks laid out in a particular order. It is now a sight to behold from the farmhouse. Fast forward 12 years and the farm has started producing. In addition to the very particular conditions above, the truffles need to experience particular climate conditions including hard frosts. For this reason they only have a very short season, through the coldest months of winter. You only have a short window to harvest them. There is about a week from immaturity to rotten! Traditionally in Europe, pigs were used to ‘hunt’ for the truffles, but in Australia, highly trained dogs are used. In the Case of ‘Parada Hills’ the dogs are hired on a weekly basis during the season at considerable cost. Parada Hills has produced modest mounts in the last couple of years, with truffles in commercial quality starting to come through, but only enough to supple a few select restaurants, Yellowtail in Terrigal being one of them. The flavour of truffle is very difficult to describe. Mostly because they are so unique that there is no real reference to draw from. They have a pungent, intense, earthy fragrance and taste. ‘forest floor’ ‘earth and chocolate’ ‘sweet yet musty’ are phrases used to describe them. They are sweet yet also have quite a petroleum like note, and can often be one or the other, depending on the truffle. You can hear more about this on our Instagram, as Dave, son of Peter and Desley discusses in detail. Check it out for yourself. Having grown up with the long wait for results, Dave has immersed himself in the truffle industry and armed himself with an immense knowledge and passion on the subject, all while maintaining a successful building career. 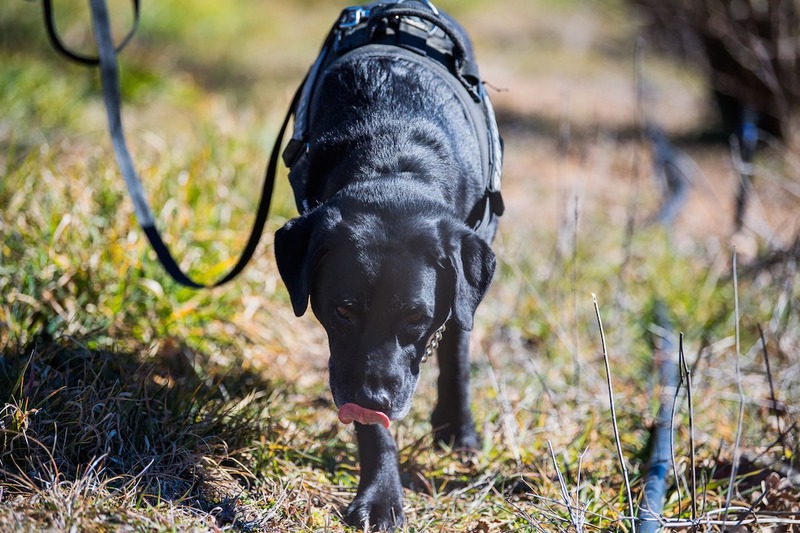 Dogs are used to locate truffles! Truffles have an affinity with a few ingredients. Game animals, poultry, mushrooms, butter and cream. The best dishes to use them in are fresh pastas, risottos, and soups. They are best grated with a microplane or shaved with a special truffle slicer or mandolin. In our opinion they should be added both during the cooking process and shaved or grated at the end. While many high end restaurants simply shave over truffle at the end and charge a hefty supplement, often $20-$40 on a single meal, at Yellowtail we believe they are such a unique seasonal product, that we form a dish around them without really charging a premium. We think everyone should be able to sample this unique ingredient. At the moment we make fresh ribbons of pasta, add some sautéed ‘guanciale’, a sort of smoked pig cheek bacon, braised leek, porcini mushroom stock, lots of grated truffle, a touch of cream and plenty of good parmesan, more truffle to finish. An entrée with few ingredients that lets the fresh pasta and truffle shine. We also serve a dry-aged ‘flat iron steak’. Essentially an oyster blade with the sinew removed. We cook it over charcoal, rest it and slice it over some truffled cauliflower puree. Finish it with some charred radish greens, a sauce heavy with truffles and red wine, and some shaved truffle to finish, there should be no doubt as to the hero of the dish. Good News For Australian Truffle Supply! As we go to print, we have received word that the second week has produced good numbers of good truffles at Parada Hills. This is great news! I certainly hope the Loftus’ can enjoy a return on the time and money they have invested to bring us this unique product, grown right here in New South Wales! At Yellowtail Terrigal, we really try to just cook great ingredients well, in simple dishes that let the produce shine. Without these passionate individuals, who dedicate themselves to these ingredients, we really wouldn’t have the restaurant that we have! Better get cracking with some new truffle dishes to make the most of them!